SHARKBITE (AUS) (Brown 2003-Stud 2009). 5 wins-2 at 2-from 1000m to 1700m, A$292,000, MRC Lord S., L. Sire of 145 rnrs, 75 wnrs, inc. SP Siorca, Shayana and of Jaws of Steel, Andrassy, Clear the Beach, Viaductress, Galeocerdo, Izenashark, Lucky Flipper, Mako Magic, Penthouse Pet, Shockwave Miss, Pearly Whites, Sasenkile, Wired, Global Squire, Jester Halo, King Shaka, Sharkpeace, Owl on the Prowl, Samikosho, Save Me Ned, Cheners, etc. HANJAABI, by Savabeel. Unplaced. 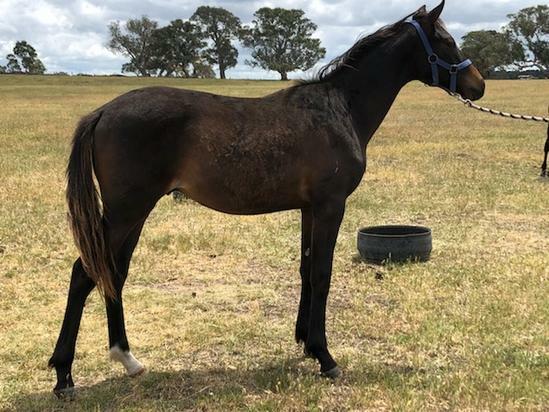 Half-sister to Tears 'n' Triumph, Skite (dam of TIMY TYLER, WALDORF). This is her first foal. Tears 'n' Triumph (O'Reilly). 7 wins from 1200m to 1600m, A$184,125, MRC Sky High H., Potrero H., 2d Kilmore Cup, L, MRC City of Glen Eira H., MVRC All Our Mob H., 3d MVRC City Pacific Finance Ballarat H., MRC Gold Stakes H., Ellerslie H., MVRC TROA William Inglis Trophy H.
Xbox (Niagara). 2 wins at 1100m, 1500m in 2017-18, ARC 0800 Horsevets H., 2d ARC Bonecrusher S., Gr.3. Boxachocolates. 4 wins from 1400m to 2000m, NZ$80,915, to 2017-18, Manawatu Cup Prelude, WRC P & R H., 2d Hawkes Bay Stella Artois H., 3d Levin RC Levin Tab & Sports Bar H., Wanganui JC St Johns Club H., 4th Manawatu Classic, Gr.3. Galway Garry. Winner at 1200m in 2016-17, 3d CJC Gavelhouse.com H., Otago RC Brocklebanks Drycleaners H., Otago Packaging Supplies H.
Jet Charged. 2 wins at 1250m, 1350m, Wanganui JC New Zealand Bloodstock Insurance Pearl Series H., 2d ARC Scott Electrical H., Manawatu RC Book With Premier Cabs H., 3d WRC Blue Star Group H.
High Adversity. 2 wins at 1600m, 1800m, 3d BRC Mount Franklin H.
Shining Star. Winner at 1200m in NZ. Producer. TIMY TYLER (No Excuse Needed). 6 wins-1 at 2-from 1200m to 1600m, NZ$227,600, CJC Winter Cup, Gr.3, Amberley Cup, CJC Coupland's Bakeries Mile Trial H., 2d Gore Guineas, L, Otago RC Mosgiel S., L, Wairio Cup, Beaumont RC Publicans Cup, Southland RC World Solar H., CJC Angus Meats H., 3d Southland Guineas, L, Foxton Cup, Oamaru Cup, Beaumont RC Speight's Ale House Publicans Cup, CJC Coupland's Bakeries Prelude H., Coupland's Bakeries H., Gore RC O'Connor Richmond H., Otago RC Fred Ferris Memorial Trophy H., WRC Magness Benrow Gold Cup, 4th CJC Easter Cup, L.
WALDORF (Highly Recommended). 3 wins-2 at 2-to 1350m, NZ$94,825, to 2017-18, Wanganui Guineas, L, Levin RC Ryder S., L, 2d WRC Wellesley S., L, 3d Waikato RC Virkon 2YO S., NZB Insurance Pearl Series 2YO S.
Regal Tan. 5 wins at 1200m, 1300m, WATC Winter Series H., Wanneroo H., Sturt H., 2d AJC Balmoral 2YO H., STC Sir Ivor 2YO H., 3d WATC Super Select H., 4th NSW Tatt's RC Ming Dynasty H., L.
Vicarious. 2 wins-1 at 2-at 1400m, 1600m, Qld Tatt's RC Wedgwood Pies H., 2d QTC Rolls Supper Club H., WRC Lemmon Piling & Drilling H., 3d HBJC Beamish Bloodstock Metric Mile, WRC Radio Pacific H.
TAKE A WALK (Bakharoff). 9 wins-2 at 2-from 1400m to 1700m, R552,580, Milnerton Queen's P., Gr.1, Premium Stakes Trial, L, 2d Clairwood Schweppes Challenge, Gr.1, Greyville Natal Provincial Guineas, Gr.3, 3d Kenilworth Top Sport Bloodline Guineas, Gr.1, Milnerton J&B Metropolitan H., Gr.1, 4th Clairwood Mainstay International, Gr.1, Milnerton Computaform S., Gr.2. VELOSO (Zamazaan). Third on The 1982-83 Australasian 3YO Classification (2100m+). 6 wins-3 at 2-from 1400m to 3200m, A$480,510, AJC Sydney Cup, Gr.1, Spring Champion S., Gr.1, VRC LKS Mackinnon S., Gr.1, 2d STC HE Tancred S., Gr.1, AJC Derby, Gr.1, VATC Caulfield Guineas, Gr.1, AJC Champagne S., Gr.1, STC Canterbury Guineas, Gr.1, AJC St Leger, Gr.2, 3d VATC Caulfield Cup, Gr.1, Victoria Derby, Gr.1, STC Rosehill Guineas, Gr.1. Sire. GANSER MACHER (Deputy Governor). 12 wins-1 at 2-at 1400m, 1600m, R215,215 in South Africa and Mauritius, Milnerton Premier's Challenge Cup, Gr.2, 3d Clairwood JG Hollis Futurity P., Gr.3, 4th Milnerton Green Point S., Gr.2. CODEWORD (Diplomatic Agent). 3 wins-2 at 2-from 1200m to 1800m, WATC Blue Ribbon S., Gr.3, Phillips H., Jovial Lad H., 3d WATC Fairetha S., L.
Roll of Honour (Ardistaan). 6 wins-2 at 2-from 1000m to 1600m, 3d ARC Eclipse S., Gr.2, WRC Wakefield Challenge S., Gr.2, Geelong RC Derby Trial S., L. Sire. PETERSBURG (Sound Reason). 3 wins at 2, Levin RC Ryder S., L, Manawatu RC Evergreen Lodge H. Sire. GREEN MACHINE (Green Perfume). 15 wins-1 at 2-to 1450m, NZ$95,975, A$90,660, Hawkes Bay GR Kelt Memorial H., L, 2d CJC Stewards' S.H., Gr.3. MARSCAY BOY (Marscay). 3 wins from 1100m to 1600m, WATC Belmont Guineas, Gr.3, VATC Kilshery H., WATC Tomito H., 2d WATC Emu Bitter H.
BAYREMAH (Kingdom Bay). Joint third top filly on The 1994-95 NZ 2YO Free H. 2 wins-1 at 2-at 1200m, Matamata Breeders' S., Gr.2, Hawkes Bay Horlicks Fillies 3YO H., 3d ARC Schweppes Juvenile H. Producer. EMAYR (Sumayr). 8 wins from 1600m to 2200m, NZ$105,490, Waikouaiti Cup, L, 2d New Zealand Cup, Gr.2. BALLINA KATE (Lord Ballina). 2 wins at 1400m, 2000m, ARC Guineas Trial, L, 3d Waikato RC Star Way S., L. Producer. TUSCANY WARRIOR (Tuscany Flyer). 6 wins from 1200m to 1600m, NZ$133,300, CJC Winter Cup, Gr.3, Marton JC Rangitikei Tavern H., WRC Cambridge Hotel H., 3d Taranaki RC Mason Appliances 4YO H., L.
(KIWI) HERO (Deputy Governor). 15 wins from 1200m to 1600m, NZ$487,175, A$27,200, New Zealand Two Thousand Guineas, Gr.1, Otaki Maori RC WFA S., Gr.1, Hawkes Bay Mudgway Partsworld S., Gr.2, ARC King's P., Gr.3, Manawatu Challenge S., L-twice, Levin S.H., L-twice, 2d WRC Captain Cook S., Gr.1, BOP RC Japan-New Zealand International Trophy, Gr.2, Rotorua RC Lion Brown P., Gr.3, 3d Waikato Draught Sprint, Gr.1, Manawatu RC Awapuni Gold Cup, Gr.2, Rotorua RC Lion Brown P., Gr.3. LA ETOILE (Thorn Park). 5 wins at 1400m, 1600m, NZ$152,212, A$76,000, ARC Rich Hill Mile, Gr.2, Hawkes Bay Te Runga Stud H., Levin RC Greyhound Racing NZ H., Manawatu RC Hong Kong Jockey Club 3YO Trophy, 2d Gold Coast Bracelet, L, BRC Spear Chief H., L, 3d Queensland Guineas, Gr.2, Rotorua S., L. Producer. RAY'S GIRL (Savabeel). 4 wins-1 at 2-from 1100m to 2100m, NZ$111,050, North Canterbury RC Canterbury S., L, 2d ARC Sunline Vase, Gr.3. LINKY DINK (Keeper). Winner at 2, A$327,750, QTC TJ Smith Classic, Gr.1. Producer. CLEARLY INNOCENT (Not a Single Doubt). 9 wins to 1400m, A$1,439,150, to 2016-17, BRC Kingsford-Smith Cup, Gr.1, Scone RC Luskin Star S., L-twice, ATC Country Championship Final, Scone RC Country Championships Qualifer, 2d ATC TAB Highway H., 3d BRC Stradbroke H., Gr.1, ATC Premiere S., Gr.2, 4th MRC Italktravel S., L.
SALE OF CENTURY (Prized). Second on The 2000-01 Australasian 3YO Classification (intermediate). 5 wins-2 at 2-from 1200m to 3200m, A$601,790, STC Rosehill Guineas, Gr.1, AJC Windsor 2YO H., STC Blackwood Group 2YO H., 2d AJC Stan Fox S., Gr.2, 3d VATC Caulfield Guineas, Gr.1, MVRC AAMI Vase, Gr.2, Ballarat Cup, L, MRC Australian Hurdle, 4th STC Ranvet S., Gr.1. AFFLECK (Battle Paint). Champion 2YO & 3YO in Singapore in 2014 & 2015. 8 wins from 1200m to 1600m, S$930,137, Singapore Guineas, L, Singapore TC Juvenile Championship, L.
HALIBERY (Red Ransom). 4 wins-3 at 2-at 1000m, 1100m, A$507,300, MRC Schillaci S., Gr.2, Blue Diamond Preview (f), Gr.3, Blue Diamond Prelude (f), Gr.3, 2d MRC Blue Diamond S., Gr.1. Producer. WARM LOVE (Octagonal). 6 wins-2 at 2-at 1000m, 1100m, A$353,668, SAJC Queen Adelaide S., L, 3d VRC Lightning S., Gr.1. WESTMINSTER (Grosvenor). 9 wins-1 at 2-from 1150m to 1600m, NZ$362,625, A$688,100, ARC Railway H., Gr.1, MVRC Manikato S., Gr.1, VRC Ampol S.H., Gr.1, MVRC John F Feehan S., Gr.2, Otaki Maori RC WFA S., Gr.2, 2d New Zealand Two Thousand Guineas, Gr.1, 3d ARC DB Draught Classic, Gr.1, VATC Elders Mile H., Gr.1, Marlboro Cup, Gr.1, VRC Gadsden S., Gr.1, MVRC John F Feehan S., Gr.2, Manikato S., Gr.2. Sire. MAKKURA (Falkirk). 9 wins to 1200m, NZ$3,125, S$548,125 in NZ and Singapore, Singapore TC Paititi Gold Trophy, L, 3d Singapore TC Kranji Sprint, L.